Kabba is taking out another loan on Kiva – OxygenWorldwide help third world people to grow their own businesses. This is an update on ourr loan to Kabba in Sierra Leone. This is 52-year-old Kabba. He is married, and has four children aged 23, 20, 16 and 14. He has one additional dependent, who lives with him and his wife. 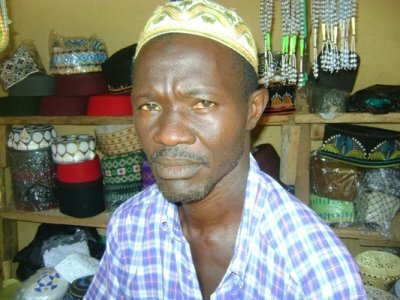 In 1997, Kabba established his muslim caps and beads business. He began his business to enable him to solve his domestic problem. His business is located in the city center and his main customers are Muslim men and women. Working 7 days a week and 10 hours a day, he earns about Le 650,000 every month from this business. He would like a loan in the amount of Le 4,000,000. Kabba has already received and successfully repaid three loans, and now requires a new loan in order to buy dozens of Muslims caps (Le 2,500,000) and dozens of Muslims beads (Le 1,500,000). He hopes that this loan shall increase his stock level and hence his additional income level. In the future, Kabba plans to complete his construction of his house, to educate his children and to rent a shop. He thanks you for your support. You can see Kabba’s new loan by visiting http://www.kiva.org/lend/593927?_te=rlnol. 1. This update was posted from Sierra Leone by Kiva’s Field Partner, Association for Rural Development (ARD). If you appreciate this update, please consider supporting another entrepreneur listed by this Field Partner. 3. Also, you can recommend or comment on this journal. 4. You can browse and search through all of the updates to loans in your portfolio on the Updates Tab. 5. And finally, if you do not wish to receive these emails, you can disable them in your account email preferences. Thanks for lending to the world’s working poor on Kiva! Thanks to the sponsorship by OxygenWorldwide, The Style Foundation’s mission to create a sustainable economy in developing countries are able to continue the work on the schools in Kenya. This project is primarily aimed at education for a better future for the population. The lodges are designed for the tourists and the income thereof will be for the maintenance of the school. The Style Foundation are very grateful for the sponsorship from the whole team at OxygenWorldwide! “Education is the most powerful weapon which you can use to change the world”. Nelson Mandela.